Primary Natural Resources manganese, limestone. A LANDLOCKED republic located in West Africa, bordering GHANA, CÔTE D’IVOIRE, and TOGO to the south, BENIN to the southeast, NIGER to the east, and MALI to the north and west. In addition to the capital, Ougadougou, major cities include Bobo-Dioulasso, Koudougou, Kaya, and Ouahigouya. The country’s terrain is largely semidesert, with less than 10 percent of the land arable without IRRIGATION. The country has several unnavigable rivers: the Komoé (Comoé) River, which flows through Côte d’Ivoire; and the Mouhon (Black Volta), Nazinon, and Nakambe (White Volta) rivers, which join in Ghana to form the Volta. The country’s predominantly rural population is spilt nearly in half in terms of religion, with 50 percent of the population practicing Islam, 40 percent practicing indigenous faiths, and the remaining 10 percent Christianity, mostly Catholicism. There are at least 50 recognized ethnic groups in Burkina Faso, dominated by the Mossi, who make up 40 percent of the population. The remainder of the population is distributed among the Gurunsi, Senufo, Lobi, Bobo, Mande, Fulani, and numerous smaller ethnic groups. French is the country’s official language, though Oyula is also spoken. While Burkina Faso has considerable mineral resources, the country remains one of the poorest in the world. Agriculture is difficult, as most of the land is untenable, and drought has prevented major irrigation projects from being undertaken. Because of the lack of agriculture, Burkina Faso must import most of its food, which contributes significantly to the country’s increasing debt. In the 12th century, most of the territory in the western part of Burkina Faso was seized by the Mossi. The states of Ougadougou, Tengkodogo, Yatenga, and Gourma in the east remained in power for approximately 500 years, the Mossi minority using religion and strong, efficient militaries to maintain control. They successfully repelled attempts by the Mali and Songhai Empires to take control of the area from the 14th to the 16th century and remained in power after the trans-Saharan trade diminished in the 17th century. Not until the 19th century, with the arrival of the French, were the Mossi states dissolved: Yatenga was made a protectorate through peaceful negotiations in 1895, Ougadougou was taken by force in 1896, and Gourma was annexed, along with several other territories, in 1897. Burkina Faso was split and redrawn several times during the colonial period: Its current borders were established in 1947. In 1960, the country achieved its independence, calling itself Upper Volta, after the territory name given to it by the French. The country experienced considerable political upheaval in the decades following independence. The country’s first president, Maurice Yaméogo, was ousted in a bloodless coup in 1966 by Sangoulé Lamizana, a colonel in Yaméogo’s army, which began a trend of military takeovers in the country. 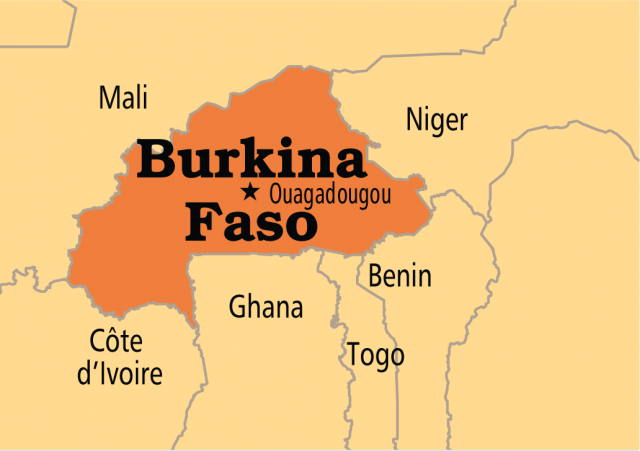 The country was renamed Burkina Faso in 1984 in symbolic rejection of the country’s colonial past, but Burkina Faso remains economically dependent upon FRANCE. Attempts at attracting foreign investment and multiparty elections in 2002 have provided Burkina Faso political stability.